Hotel Lawyer with an update on hotel industry prospects. 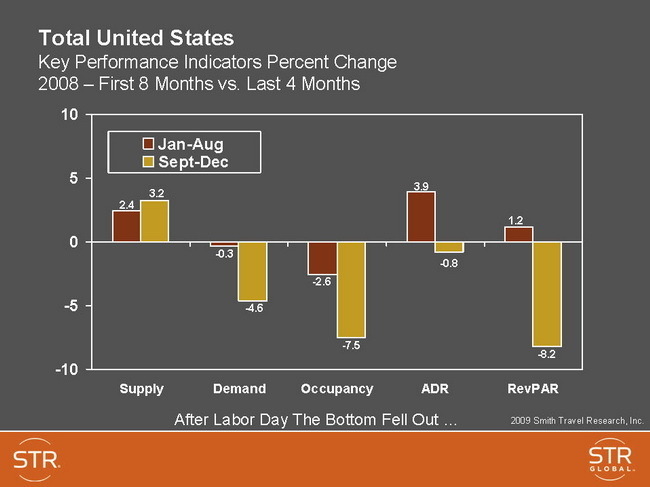 As we have been reporting, the data coming in from the field continues to show deteriorating economic results in the hotel industry. Here’s the latest on how 2008 ended up, and how 2009 and 2010 are shaping up now, including a special report on the hotel industry from Moody’s. 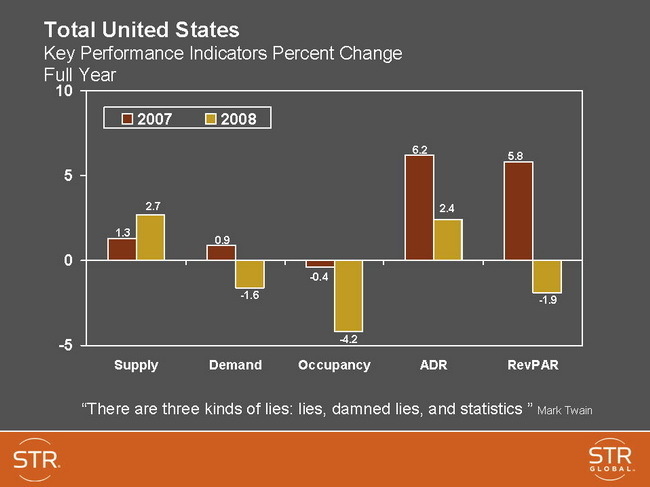 Smith Travel Research has reported the final numbers on the hotel industry’s performance for calendar 2008, summarized in the chart below. You really have to view 2008 as two distinct periods: The first 8 months of 2008 (from January through August) were not bad, and the last 4 months when the bottom fell out of the hotel industry. In the first part of the year, RevPAR was up 1.2 percent, but in the last part RevPAR fell 8.2%. In other words, things were so bad in the last four months of 2008 that the loss wiped out the gain from the entire rest of the year. the impact of RevPAR declines on NOI will depend upon the occupancy level of the hotel as it enters 2009. 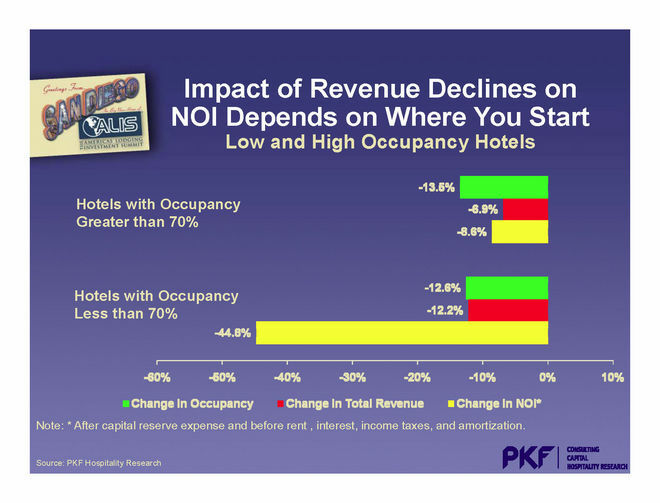 PKF projects that high occupancy hotels (with occupancy greater than 70%) will have NOI declines of 8.6%, while hotels with less than 70% occupancy will suffer a 44.8% NOI decline! Predictions for 2009 and 2010? When you look what happened after Labor Day 2008, you see that the hospitality industry has taken a terrible punishment from the financial crisis, the recession, business cutbacks, a collapse in consumer confidence, unemployment and all the related problems. This suggests that the last part of 2008 marked the beginning of a new trend that will continue until the economy improves. 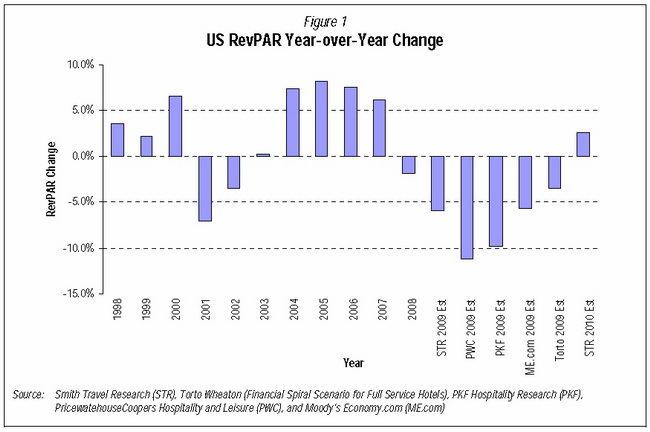 Moody’s special report on the hotel industry summarizes the impact by saying that industry leaders are predicting 2009 RevPAR declines of between 3.5% to 11.2%. While the average of these predictions is -7.0%, the most recent two updated forecasts are also the most pessimistic. PKF is predicting a 9.8% decline and PricewaterhouseCoopers is predicting an 11.2% decline, as summarized in the slide below. The bottom line is that all analysts predict things will get worse in 2009, and generally predict that RevPAR growth will continue to deteriorate in 2010 until the second half of 2010 when RevPAR finally begins to turn positive. Moody’s agrees and is projecting 5.7% RevPAR decline in 2009, and then RevPAR growth of 2.0% for 2010, but coming in the second half of the year. As of February 20, 2009, STR was predicting a slightly worse 2009 and a slightly better 20010 as shown in the slide below. PKF is predicting a 9.8% RevPAR decline and PricewaterhouseCoopers is predicting an 11.2% RevPAR decline . .
What does falling RevPAR mean in terms of NOI and values? Moody’s summary of the analyst’s opinions suggests a potential 30% further decline in hotel values for 2009 (on top of the damage already done in 2008). . I found one of the most interesting parts of the Moody’s Special Report to be analyzing the impact of declining RevPAR on NOI, and resulting changes in value. They concluded that a 7% hit to the top line would translate into a 16% decline in net cash flow at a typical full-service hotel because of the relatively high fixed cost structure, and increasing expenses. By itself, this would suggest that a 7% decrease in revenues would cause a 16% drop in value. But industry experts expect further increases in cap rates on hotel valuations. Therefore, on the same 7% decline in revenues, Moody’s calculates that a 100 basis point increase in cap rates would cause hotel values to decline by 24%, and a 200 basis point increase would be translate into a 30% decline in hotel values. PKF Consulting’s latest analysis sees bigger NOI decline — up to 48% for hotels with under 70% occupancy. And perhaps more importantly, PKF’s Mark Woodworth says that the impact of RevPAR declines on NOI will depend upon the occupancy level of the hotel as it enters 2009. PKF projects that high occupancy hotels (with occupancy greater than 70%) will have NOI declines of 8.6%, while hotels with less than 70% occupancy will suffer a 44.8% NOI decline! And remember, the 48% decline in NOI for 2009 will translate into even bigger drops in value with increasing cap rates! What does this mean for hotel loans — particularly CMBS hotel loans? What do these potential value declines mean in terms of loan to value ratios — both to meet loan covenants and to obtain new financing when the financial system finally recovers? According to PKF Consulting, at the end of 2008, more than 80% of the hotel CMBS loans originated since 2005 have less than a 70% loan to value ratio. Therefore, the expected loss in values in 2009 from declining revenues and increased cap rates will have a very serious impact. Hotel Lawyer: What lies ahead? What’s the bailout cost $700 billion? $3 trillion? $20 trillion? What does Dr. Doom mean by an L-shaped Depression? Hotel bankruptcies, workouts and turnarounds: Hotel Lawyers on the TARP, the TALF, and the ugly. What does it mean to hotel owners and lenders? Hotel Lawyers: How do we pay for this? And what happens next? Distressed hotel assets find no fast relief in bailout plan. Up to $1 trillion “bad bank” to take toxic assets. No critical details yet. Troubled Hotel Loans: Turning point or just another ledge on the cliff before we go over the edge? Bad bank rescue and RTC-2 ahead? Latest insights from JMBM’s Hotel Attorneys and PKF Consulting on what lies ahead for the hotel industry . . . Fortunes will be made . . . or lost . . . in the wake of The Financial Bailout Bill and the Panic of 2008. What happens AFTER the Bailout Bill . . .